In 2004, African Sky was born out of love for and the desire to spread awareness of the people and cultures of Mali. Since then, African Sky has developed a wide array of unique collaborations with individuals and groups who share a passion for Mali. Over a year ago when African Sky Founder and Executive Director Scott Lacy heard about two returned Peace Corps volunteers wanting to reconnect individuals with their original host families, he scheduled a web conference—and that day a new project was born: Kini Fe. The idea came to Lukas Baldrige and Max Diaz years after they finished their service in Mali, where they first met as Peace Corps trainees in 2010. Lukas and Max developed strong connections to their host families as well as to each other. But two years later, their worlds were turned upside down when they were forced to evacuate Mali due to safety concerns, and they were unable to share proper goodbyes with their beloved host families. After reconnecting with old friends and their communities in Mali, Lukas and Max wondered if they could coordinate with those on the ground to connect other retired volunteers with their former host families to make staying in touch possible. So Lukas and Max started reaching out to their volunteer friends to see if there was any interest. One particular friend, Colleen Naughton, the Associate Director at African Sky, immediately thought to put them in touch with Scott. After being taken under African Sky’s wing, Lukas and Max began to reach out to retired volunteers who had been stationed in their same communities. They actively worked with volunteers to collect the donations—fifty kilos of rice, three personal photos, and a phone number and message exchange—that they decided to gift five or six families per village. After two months of planning and coordination, the first donation to Max’s village was ready for delivery. At the time, Lukas and Max had a friend living in Bamako who agreed to take photos of the families receiving the gifts, while keeping them in the loop of how everything went. When that phone call came to tell them of the first successful delivery and the overwhelming emotions that it aroused, they were absolutely speechless. “That was the day we were like, this is going to be something that we want to keep doing,” Lukas recalled. “It’s going to be real and we’re going to keep chasing it. It was awesome.” Lukas and Max did just that, completing seven successful shipments last year alone. 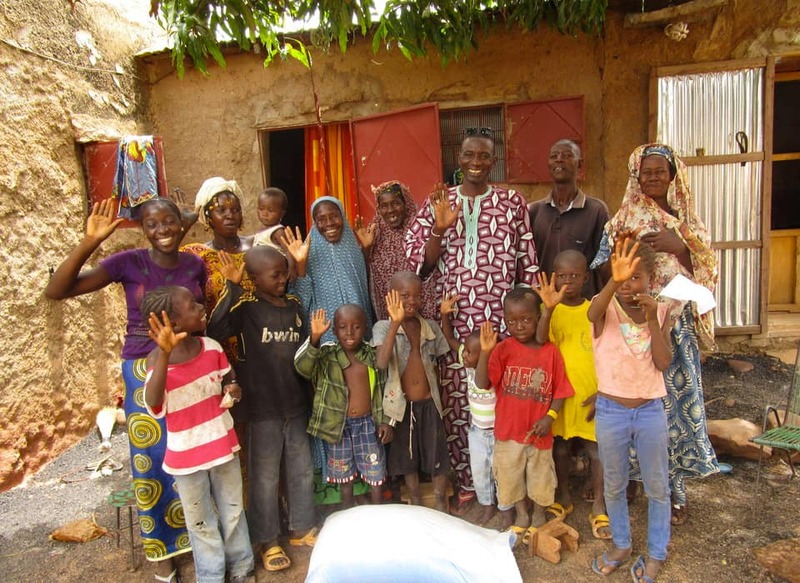 They faced challenges with communication and locating returned Peace Corps Mali volunteers, but the connections African Sky created helped execute the whole process. Lukas and Max want to expand to other parts of Mali. First, they reconnected volunteers with their host communities from their Peace Corps training hosts, but now they are ready to reconnect volunteers with the communities in which they served. They just went back to Mali in February, where Scott connected them to one of our newest Malian partners, Baba, who has been assisting African Sky with expanding our programs into new regions in Mali. Looking toward the future, Lukas and Max are keeping busy with Kini Fe. As the project grows and reaches into different regions of Mali, African Sky is here to support this initiative to keep returned volunteers connected with their host families.